Phuket is a UNESCO city of gastronomy and for good reason. This Southern Thai island is replete with delicious foodie gems stemming from their history and migrant population. 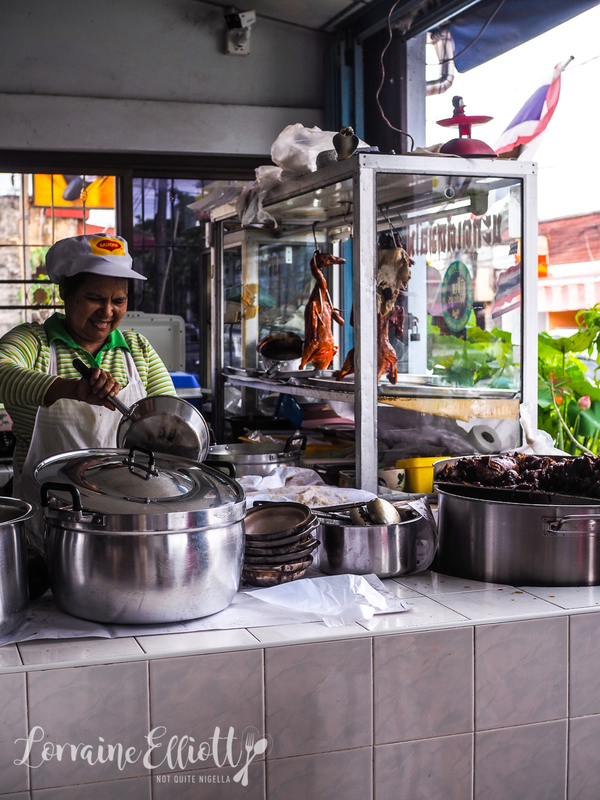 Follow this guide to taste the best of Phuket's local food! 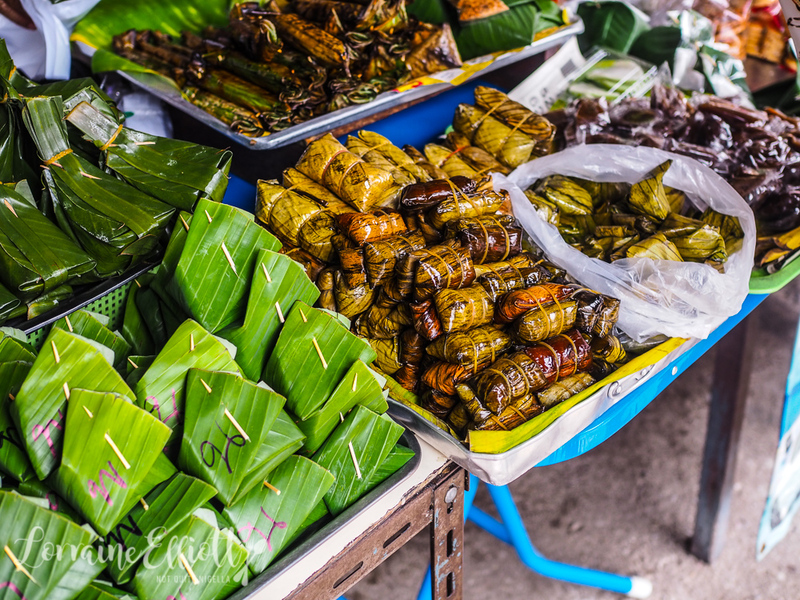 Sorry I got a bit pushy there with the title of this post but you see I had the absolute best day of eating in Phuket while researching this list. 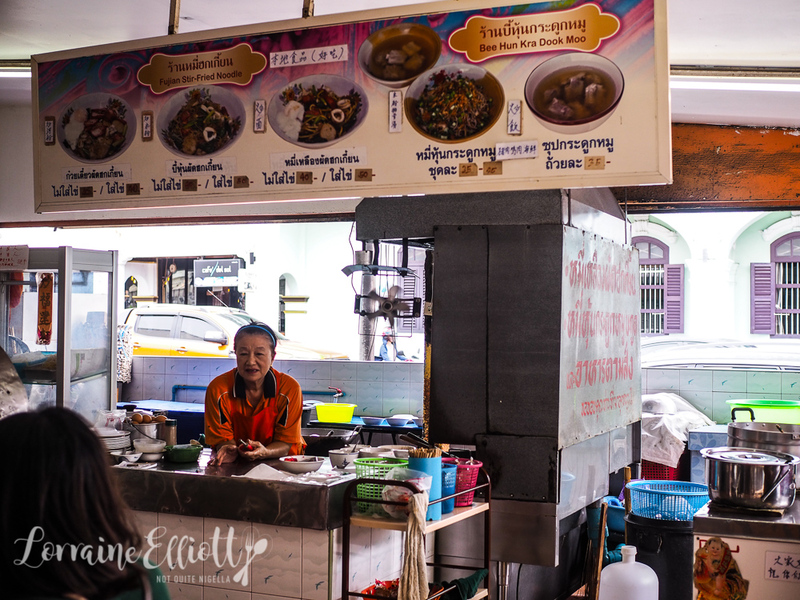 Most of the time lists say that Phuket's local food gems are items like Pad Thai or Som Tum but these aren't from Phuket (som tum is Isaan food) but there are some genuine Phuket local street foods. 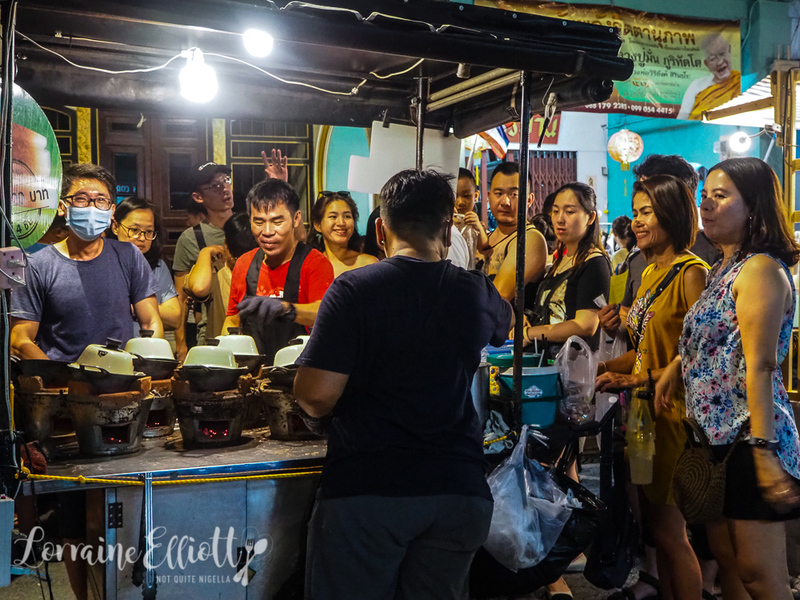 If you're lucky enough to be in Phuket on a Sunday, around 5pm head towards Yard Lai's Sunday walking market on Thalang Road where you'll get to try a lot of these local street foods without having to travel all around Phuket. 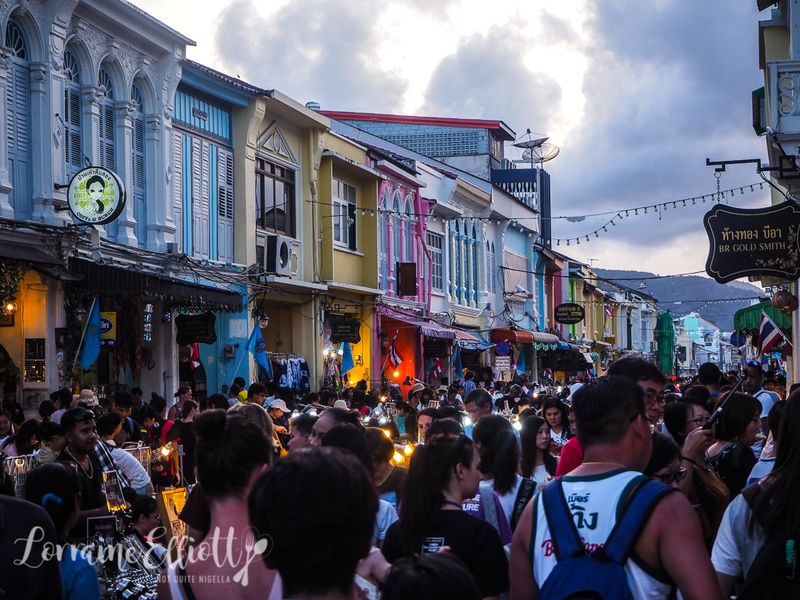 It is crowded though and full of energy from the vendors and tourists. 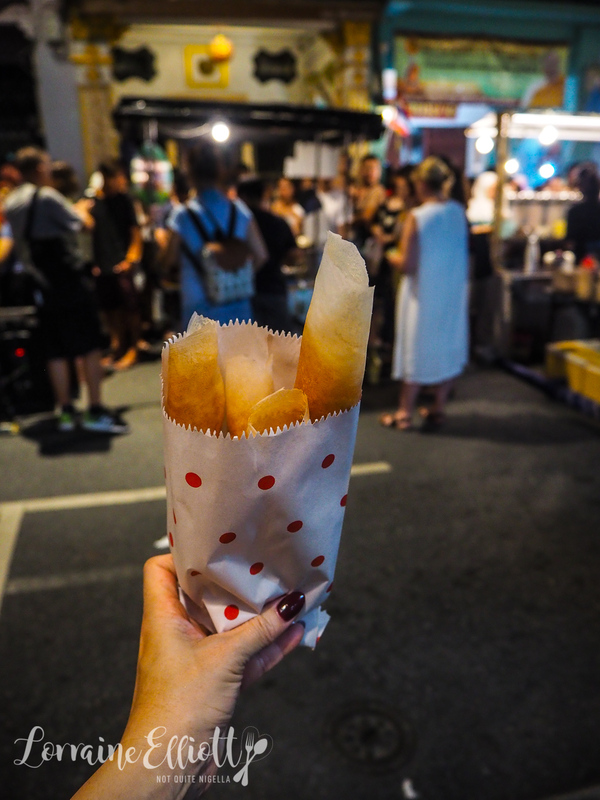 But if you're in town on a weekday there is still plenty of street food to be had. 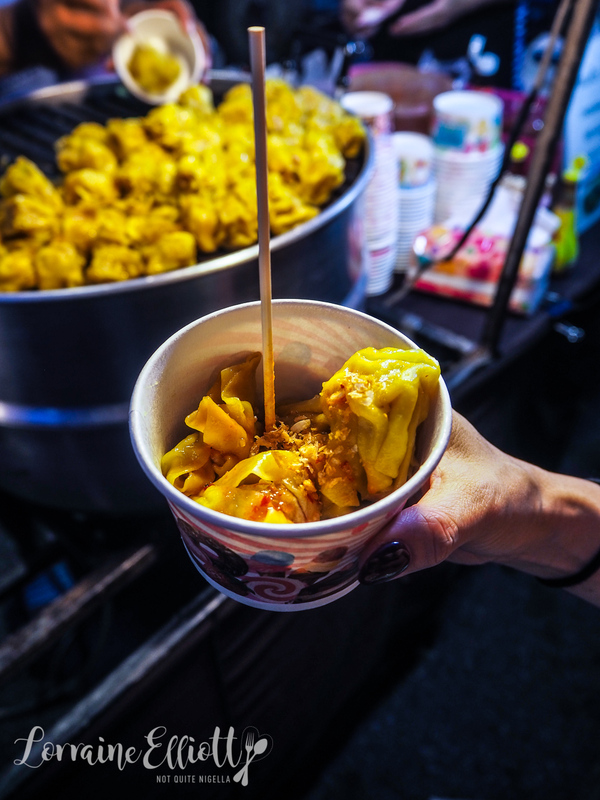 Download the Phuket street food app and walk between stops (but a warning, there will be a lot of walking). Or do as we did, hire a driver to get you around (Phuket and its old town is enormous and Mr NQN had hurt his foot rock climbing). 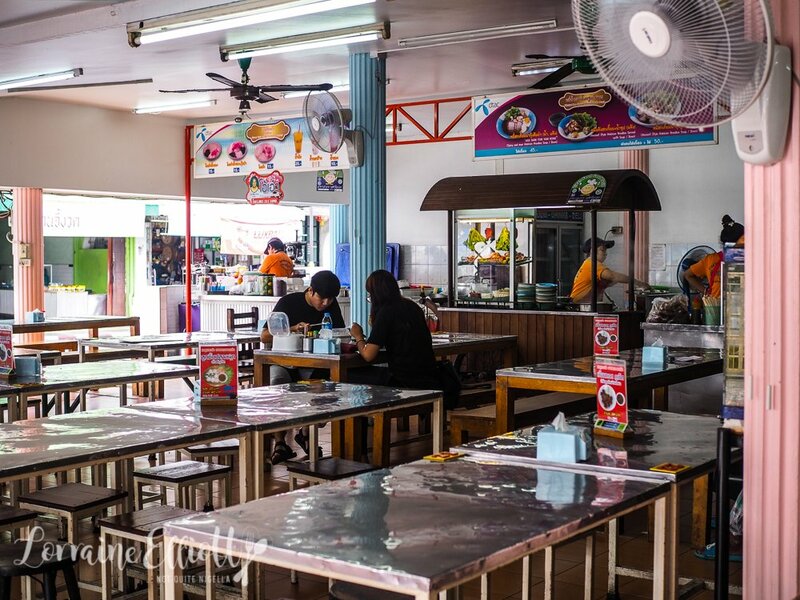 Or situate yourself at a food court like Lok Thien and try some of Phuket's best foodie gems. 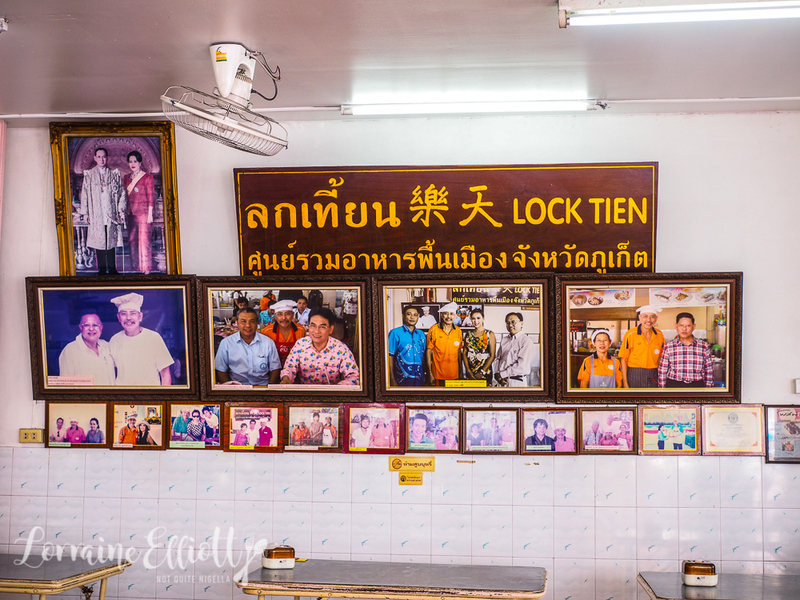 Lok Thien is an open air undercover food court that has been operating for 50 years and it is clean, full of locals and you simply order what you want and pay the person that brings it to you. It is a bit of a walk from the centre of Old Town (about 20-30 minutes walk). Chances are any Aa Phong vendor is likely to have a crowd gathered around it. 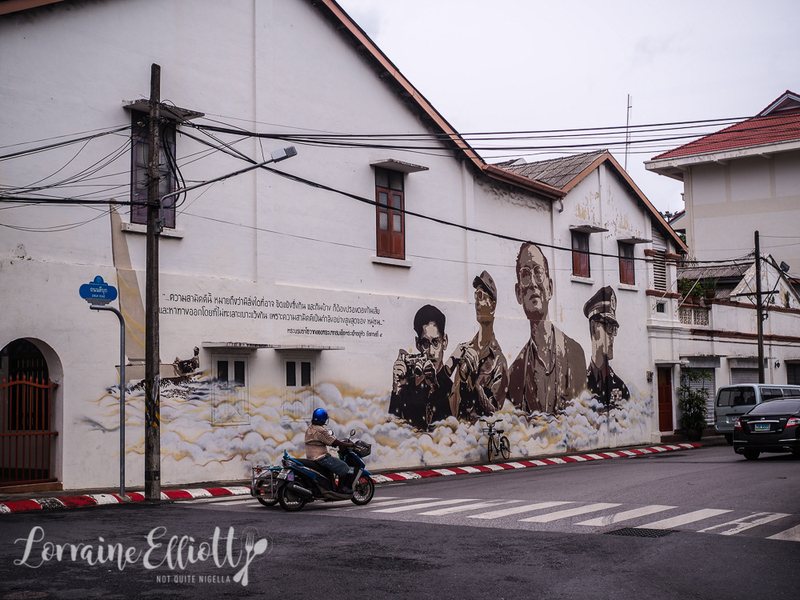 They're drawn by the sight of staff working fast and furious flipping the lids on the clay pots trying to see when the Aa Phong or coconut crepes are ready like they're playing a game of whack a mole. They're a simple item made with coconut milk, sugar and rice flour. Eat them hot off the heat as they're so delicately thin and crispy. Over time they transform into a softer crepe. 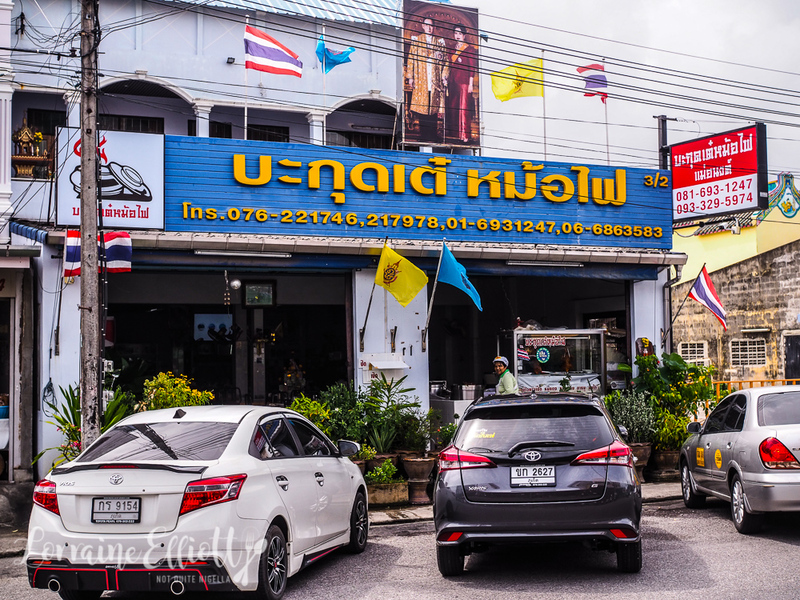 Lok Thien food court is a great place to try a lot of Phuket's local food in one spot. And the best item here (along with the lo bah) is the Mee Hokkien. 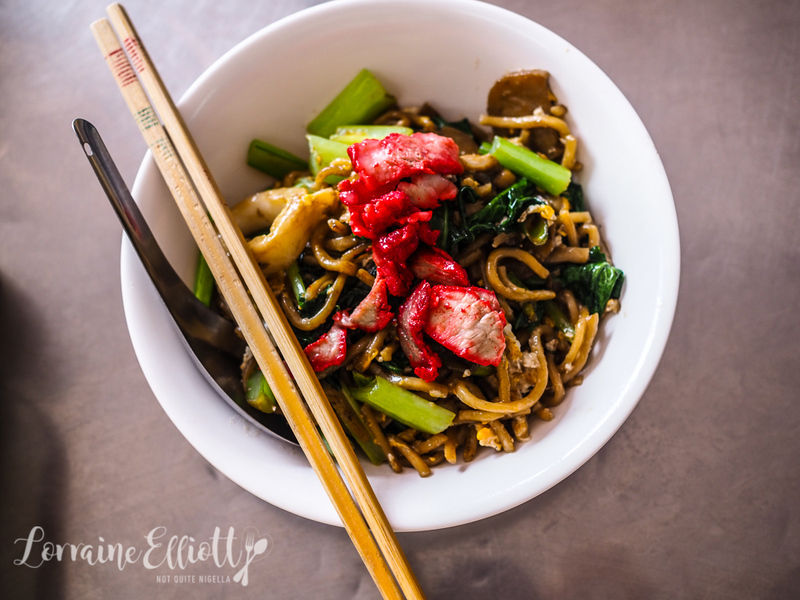 You've probably had hokkien noodles plenty of times but the ones here have so much flavour and just the right amount of toppings. 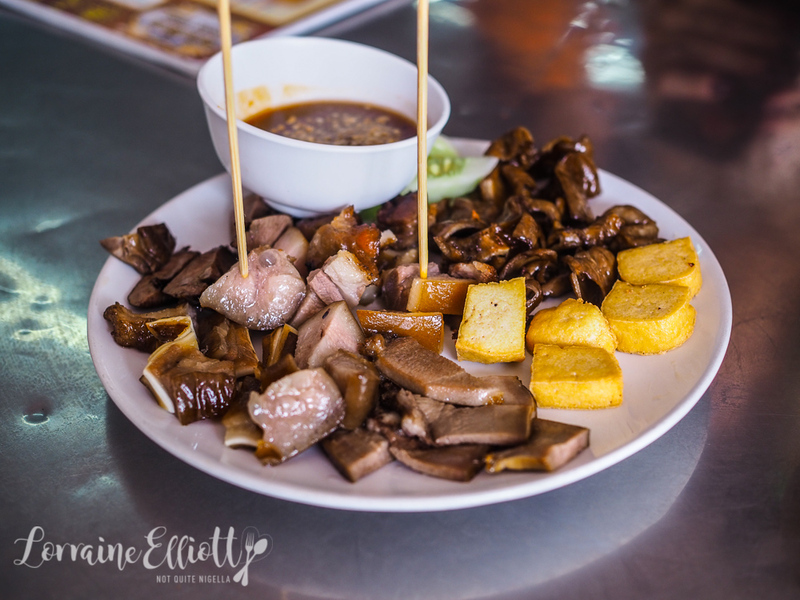 These are stir fried with eggs, pork, char siu, fish balls, squid and greens and then soy sauce and shrimp broth with fine pork cracking and shallots to create their famous dish. It is so popular they have been serving this dish here for over 60 years. 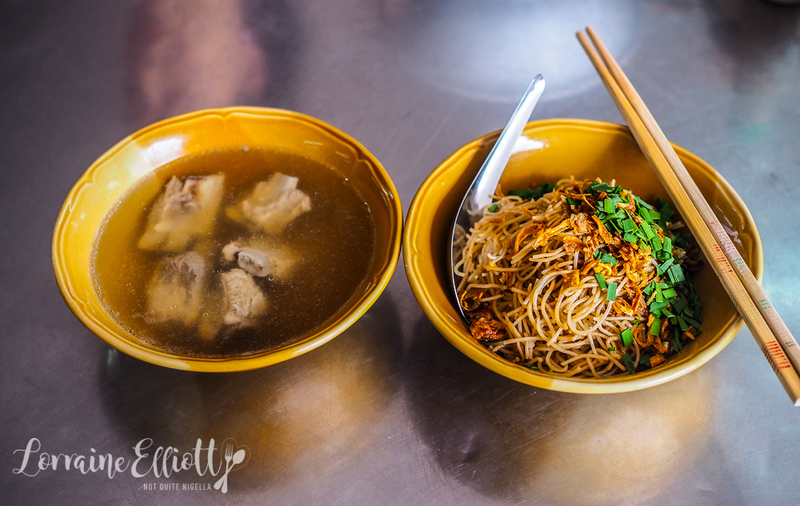 At the same stand you can also order another local Phuket dish called Mee Hoon Kra Doog Moo which is a stir fried soy sauce vermicelli noodle dish that comes with a bowl of clear pork rib soup. The crunchy layer of garnish on top made of crispy onions and chopped Chinese chives is what makes this so moreish. 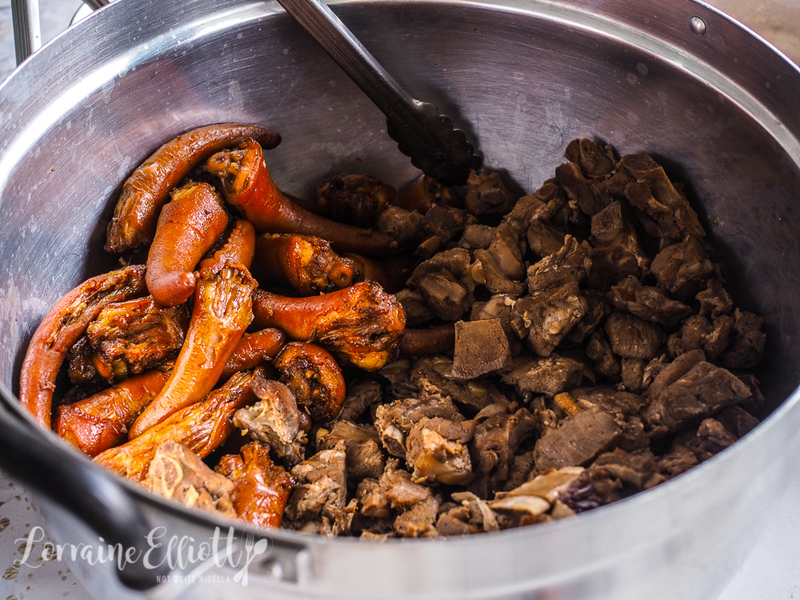 The pork soup is no afterthought with the pork rib bones cooking and imparting their flavour for hours alongside sugar cane, soy sauce and Cogon grass root which makes this a tonic for ails such as mouth ulcers, sore throats, diabetes and high blood pressure. 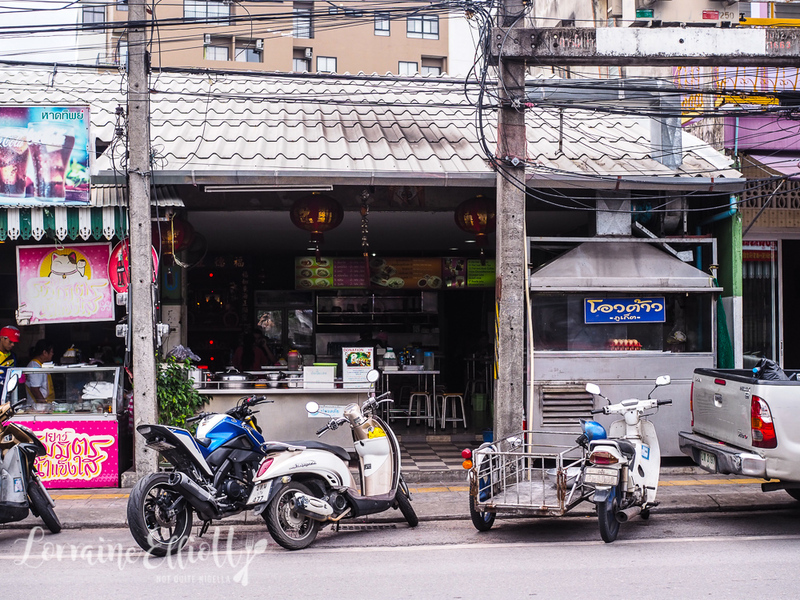 There is a strong influence of Chinese migrants in Phuket and its food. 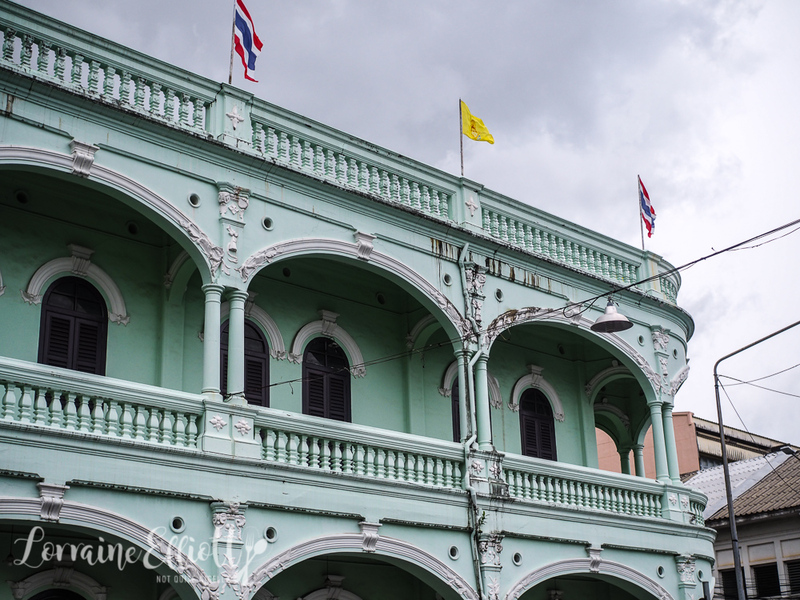 They arrived in Phuket in the late 1800's to work in the tin mines as well as to do business. And Phuket is home to various types of dim sum given a Thai spin-the pork siu mai are deliciously meaty but with a distinct sweetness and a spiciness from chilli sauce. A word of warning though: Dim Sum is a morning activity and all dim sum places of note will close at either 11am or by noon. If you find your energy flagging in the afternoon, stop for a snack of Lo Bah or deep fried and marinated pork offal. They come with little pieces of fried tofu, cucumber pieces and an incredibly tasty sweet and spicy dipping sauce. Some pieces are quite fatty but the sweet marinade is heavenly. We also found this at Lok Thien food court. Lok Thien is where we also tried Po Pia, a dish that I commonly associate with childhood trips to Singapore to see my mother's family. 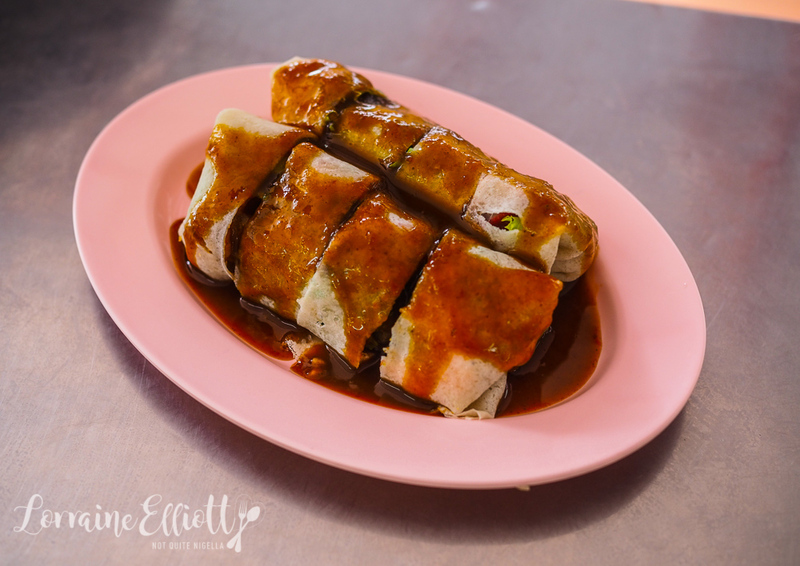 It starts with a steamed rice flour pancake filled with lettuce, pork, prawns, crispy pork and vegetables and coated in a sweet and spicy sauce. The Po Pia stall at Lok Thien stall has been going strong for four generations. 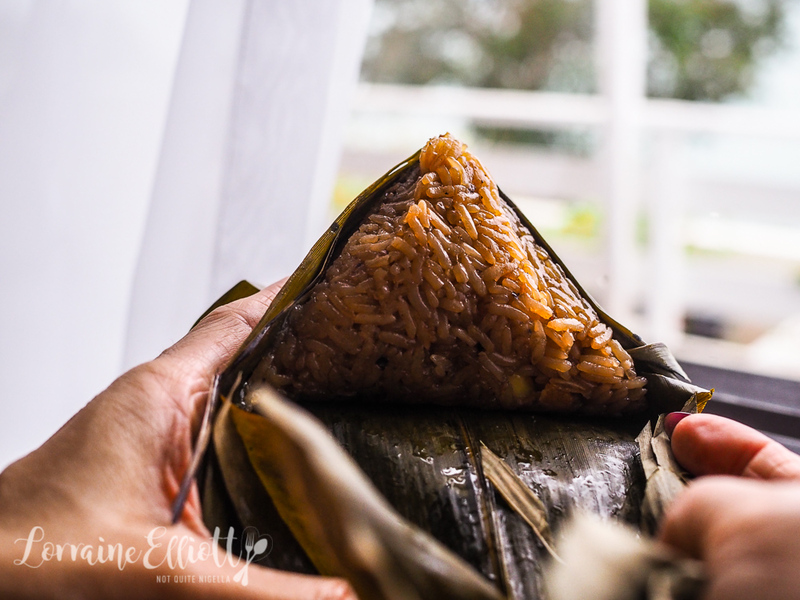 Chinese sticky rice dumplings are also known as zongzi. But dare I say these are possibly even better than zongzi or at least more flavoursome. There's plenty of soft, slow cooked and sweet salty pork meat as well as gingko nuts from end to end. They're also slightly smaller than a lot of zongzi with rice well seasoned throughout and no dead ends. 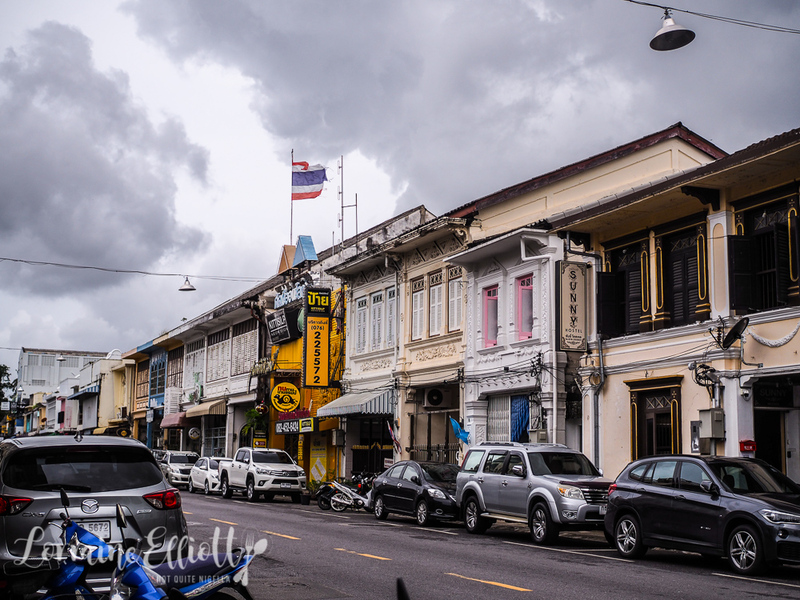 The best * Bak chang is said to be at Pae Kang in Phuket town*. 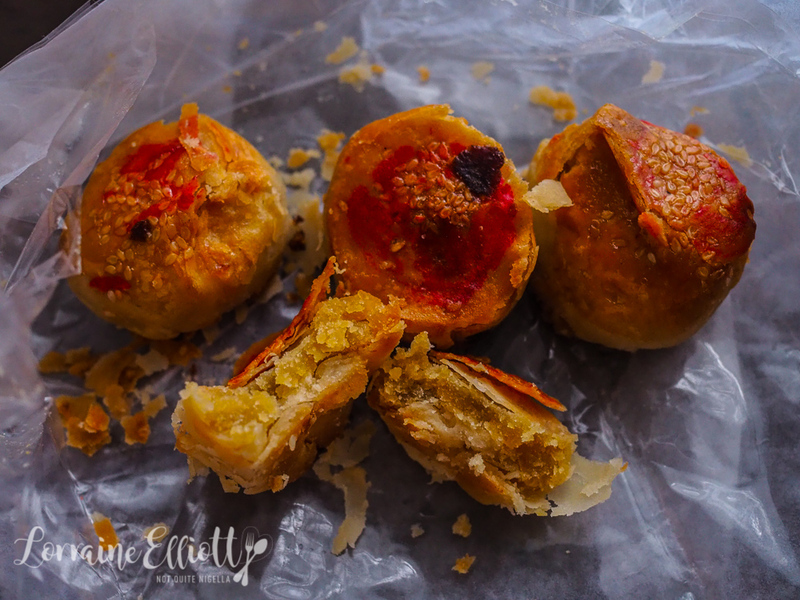 And while We also tried to find their sweet cousin, the elusive Kee Jang but weren't able to (they're sold at the Talad Yai Sunday walking market). Like many of Phuket's local delights, tao sor has its origins in Chinese cuisine. Although I don't mind the Chinese version of these, the Phuket version is IMHO much better as it is less dry and with a better balance of flavours. These tiny little cakes are filled with mung bean, salt, pepper, black sesame and salty eggs. We bought these from a lady who was walking through the Lok Thien food court selling these (4 cakes for 20 baht). But if you don't see her you can find plenty of shops that sell these. If you walk further down on Dibuk Rd, there's another shop that sells a large range of cakes and there is a woman there who is very friendly. 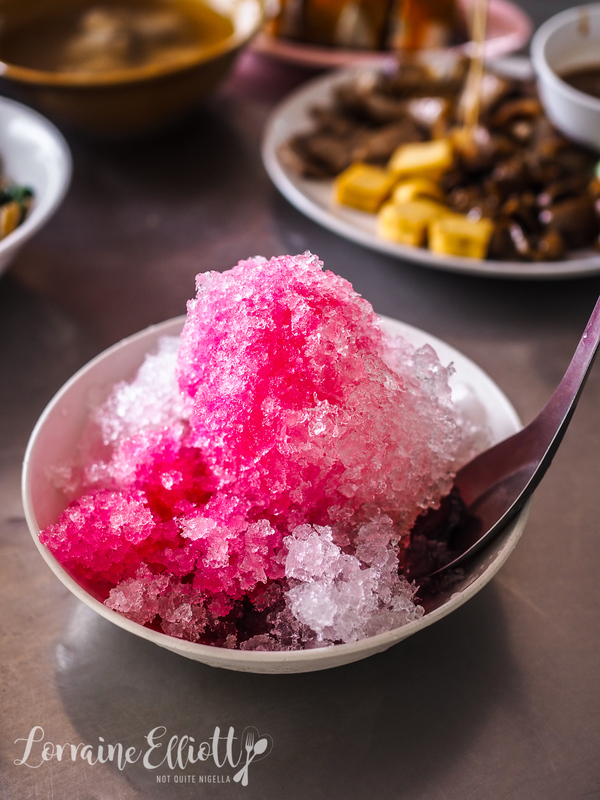 A sweet, simpler version of Ice Kacang and other shave ice desserts Oh Ew is served with red beans, red syrup, grass jelly, palm seeds. Said to be hard to find outside Phuket it may just be the tonic for a hot day and is said to be Phuket's signature dessert. This was found at Lok Thien and there is also a stand that sells it around the corner on Dibuk Rd but it is only open for a couple of hours a day. I became obsessed with trying one dish while I was in Phuket. O-Tao or oyster omelette is of Hokkien origins. It's not easy to find especially during the day as it is more of a night item. But where there's a will there's a way and thanks to our patient driver we found it. It is located at Yao Yen-Ta-Fo shop on the same road in a little food court (45 Patipat Road Talad Nuea). 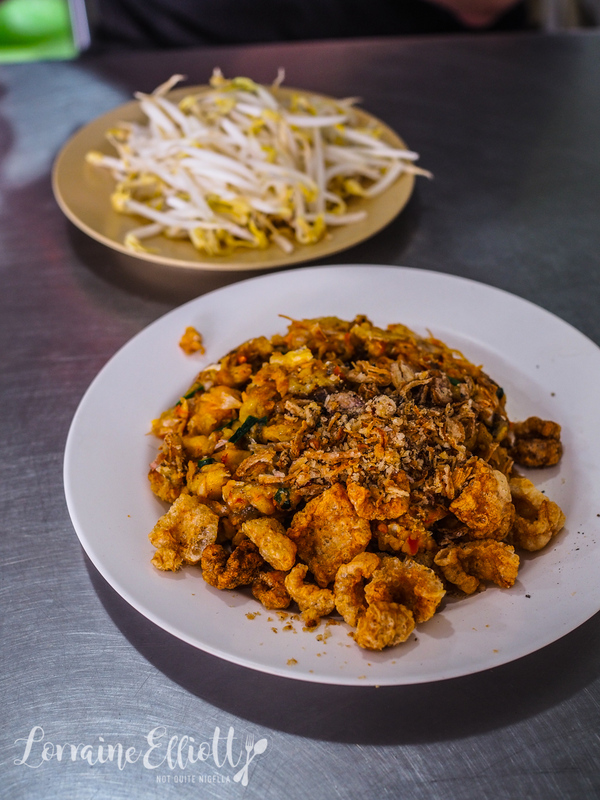 It's tiny oysters stir fried with flour, eggs, onion, garlic and cubes of taro and topped with crunchy pork crackling pieces, fried onions and garlic and served with bean sprouts. And holy heavens it is delicious. The one man making it is nice and friendly and either wraps them up in banana leaf for takeaway or on a plate for eating in. This is worth a special trip. "Number 1 Bak kut teh,"" our driver says and he puts the car into drive and needs no directions to get to the Bak Kut Teh stop. 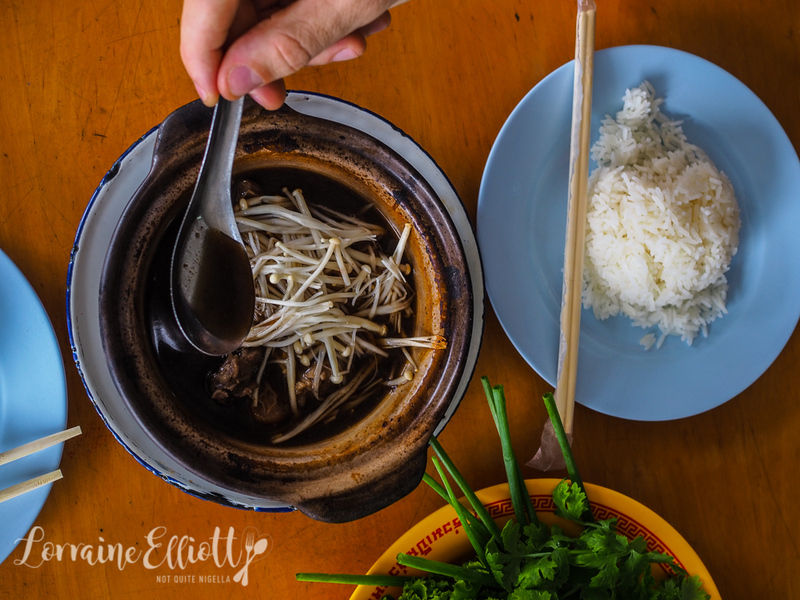 He is very familiar with the Bah Kut Teh on Soi Poonphol 7 as he goes there often. Originally a Malaysian Singaporean dish with medicinal properties the version here in Phuket has less of the medicinal flavour although it's full of flavour. Pork ribs and kidneys are simmered in a clay pot with Chinese herbs, cinnamon, star anise, clove, tree basil and garlic. The family that runs this shop are very friendly and helpful. The woman behind the counter asks if we would like pig's tail or pork ribs with ours-I ask if we have a bit of both and she takes a cleaver to the pig's tail and chops us some pieces before ladling up some soup into a clay pot and adds some enoki mushrooms on top. 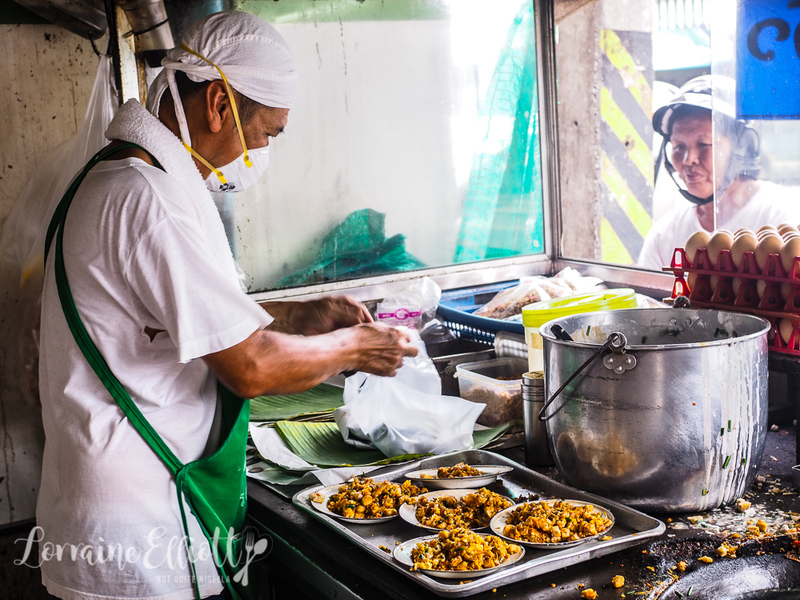 So tell me Dear Reader, do you ever put together your own eating tours? 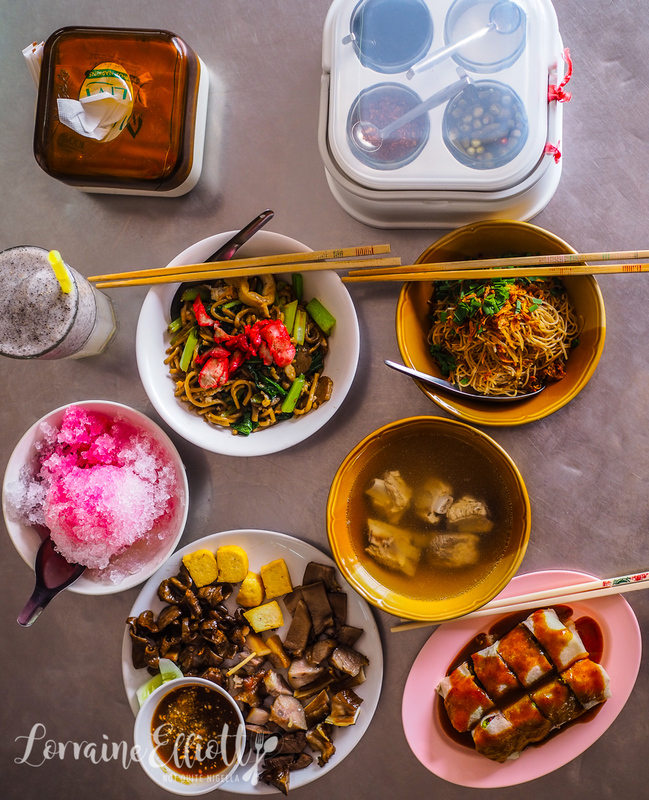 Have you tried these dishes in Phuket before? Have you ever spent a whole day eating? This food was independently paid for. Open from 06:30 – 17:00 or until sold out. Closed Tuesdays.